If you live in or near Btown, you’ve had a Cutler’s sugar cookie. The secret to their puffy, soft cookies is (drum roll) Cake Flour.Yes, even though we are trained to never use cake flour in cookie recipes, that’s exactly what Curt uses. He likes the texture and finished product. Apparently, we all love it too. 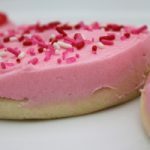 Valentines Day is their single biggest cookies day of the year! If you want to make your own at home, here’s the recipe. If not, run by Cutler’s and buy a dozen or two. I buy them when I don’t have time to make my own and place them in a cellophane bag with a pretty ribbon. Perfect treat for your Valentine. Roll to about 1/4 inch thick and form (cut) cookies and bake at 350 for 10 minutes. Top the cookies with either frosting or glaze, below. Frosting: Beat soft butter and powdered sugar together until smooth. Add a splash of milk and vanilla, blend well. Tint frosting with food color as desired. Decorate with sprinkles immediately after frosting. Glaze: Place powdered sugar in a large bowl. Add almond emulsion or almond extract to the powdered sugar, along with water, a little at a time whisking to combine. Continue whisking until smooth. Add just enough water to make a smooth glaze that stays on a knife when the knife is dipped in the glaze. -*almond emulsion is sold at specialty cooking stores (Orson Gygi's in Salt Lake City) or stores where cake decorating supplies are sold.-** Meringue powder is also sold at specialty cooking stores. Cutler's uses meringue powder to create a shiny effect on their glaze. It is optional when making the glaze.-If the glaze starts to get too stiff, add a small amount of water until desired consistency. I think it is 4-5 cups of powdered sugar right? :-)Thank you for the recipe delicious!!!!!! Love Cutler's sugar cookies. Thanks for posting the recipe. I hear we have a "mutual" friend who has a child going to Puebla (spelling?). Hey! I was wondering if they will ever share their oatmeal rasin cookie recipe? I love, love, love those! My husband will be happy for the sugar cookie recipe. He feels the same way about their sugar cookies as I do the oatmeal. Thanks for such a wonderful blog. Everything I have made from it I have thoroughly enjoyed. I check you out several times a week! Thanks so much!! thanks so much. I will request the oatmeal recipe…maybe Curt will be kind enough to teach another class soon! I'm also wondering about the glaze frosting recipe-I like that even better than the butter cream! But I understand if they didn't share it…they still need people to come buy cookies! Hi Linda, Just posted the glaze recipe! Thank you, Si. I really appreciate you and Cutler's sharing this recipe! They look stunning. Well done! THANKS! You and the Cutler family are so kind to share. That is very generous. I to love their oatmeal raisin cookies. And the brownie with mint and the lemon and all of their cookies! I've eaten a few. . . . Ok a lot of their cookies. Glad that worked for you Katie, thanks for letting us know! I made these into cookie bars and then used the frosting on the bars, they turned out great! I baked them for 17 min and they turned out perfect! Oh yummy! I live in Bountiful, I think I have had every other cookie but the sugar cookies at Cutlers, I am going to have to try these. I mostly get the mint brownie and the lemon melt aways, those are my fave. I just saw your link to south fork hardware, I had no idea they had cooking classes there, how fun! I found my way here because someone pinned these cookies on pinterest and I am so glad I found your blog, I am going to have to check it out! Amy, great to meet you on Wednesday at the class! Hope to see you again soon . I also saw these on pinterest and they look absolutely divine! Frosted sugar cookies are THE BEST. I'm wondering if you glaze the cookies before you frost them with the buttercream? From the recipe I couldn't tell when the glaze is used. I'm a BYU grad but I'm not from Utah, so I'm unfamiliar with Cutler's bakery. Sounds like I should check them out the next time I'm in Utah! Next time you are in town, stop by Cutlers and try a few of their cookies. My favorites are the Peanut Butter/Chocolate and the Frosted Sugar. Oh, I also love the Brownie Marshmallow! Oh my goodness, these look amazing. 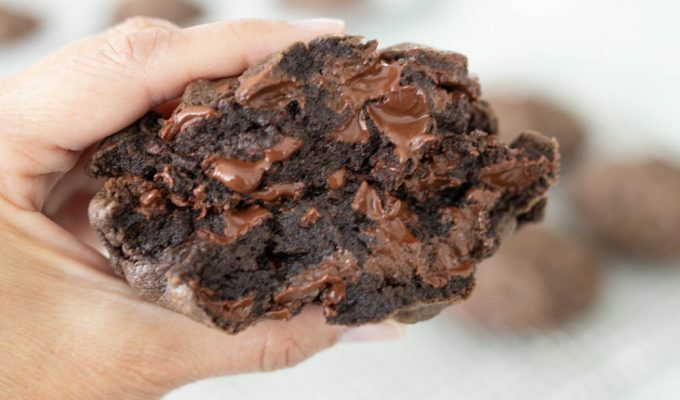 How in the world did you get your hands on this recipe? Don't get me wrong, we are forever in your debt! Thanks for sharing. Hi Liz, Curt taught a class at South Fork in North Salt Lake recently and shared his techniques and recipe! The link for current class schedule is on the right column of my blog, he teaches every month or two. Is the frosting supposed to taste grainy? I don't know what/if I did something wrong but I don't like how sugary it tastes (and I really did use confectioners sugar, not granular ha!) The cookies are divine by the way, thank you for sharing! No, the frosting is not suppose to be grainy! Make sure to have the butter at room temperature and beat in the sugar until it is all mixed together and smooth. Then continue to beat for about 3-4 minutes until the sugar and butter are mixed well and the frosting is a creamy, light texture. If it tastes too sweet, add a pinch or two of salt. I always add a pinch of salt to my frostings. I didn't add it to this recipe, because it is the Cutler's recipe. Hope you will try it again and let us know how it turns out! Also if it tastes grainy, the batch is not ruined, just continue to beat. The butter will eventually soften enough to blend with the sugar. Thank you, I'll try a pinch or two of salt next time, I did blend it more and added an 8oz box of cream cheese and absolutely love the frosting now, more to my liking I guess. And it wasn't grainy after more beating ha. Thanks again! Check back in September for the Peanut Butter chocolate recipe. Curt is teaching a class at South Fork on this very cookie and Ill post it after! I just recently moved to Bountiful and have only had a Cutler's cupcake and was rather disappointed. HOWEVER. These cookies look delicious!! Maybe I just picked the wrong treat? I'll definitely be making these. I think the cookies are the best treat at Cutler's! These were easy to make and super delicious. Thank you!! Do you happen to have a recipe for the Cutler's snickerdoodle or the lemon melt away? Also do you have a cookbook out? Help Help, This is the first time I try this recipe specially for my son's birthday, but I try to roll the dough and is very soft and difficult the handle, which flour can I use to put on the counter??? Add a little more cake flour to the dough, and you can use either cake or regular flour onto the counter top. This recipe is written for a dry Utah climate, so it may require additional flour in other parts of the world. Even in Utah, I add a bit of flour to get this recipe to roll out properly. ps, sorry I didn't see this question earlier! Just wondering how many cookies the recipe makes? Alex, Usually about 3 dozen cookies. S you frost them, then glaze them? Nicole, I should have made that more clear! You may either frost OR glaze the cookies. I prefer frost, but lots of people love the glazed. I've never seen something like that here in Italy! Thanks for sharing, I'm going to try them, sure! P.S. I tried to find the famous "(un)sulted butter" but here we have only BUTTER… Do you think it could be a problem to make your Fresh apple cake? i am seriously thinking of using this recipe for a black n white cookie.. is it very cake like?? I've had black and white cookies, and cutler's sugar cookies. The texture is totally different. Even though the Cutler's cookie calls for cake flour, it has a much more dense texture than a black and white cookie. The black and white is definitely a more cake-like cookie. That said, if you are not trying to mimic the texture of a black and white, but just want to create a cookie that looks like a black and white, the Cutler's cookie recipe will work to create a cookie that will look similar, and stand up to dipping. Is it best to use Unsalted or salted butter for the cookies and the buttercream frosting? Looking forward to trying this recipe!